Friday night, October 31, 2014, I will be at the annual Witches’ Cotillion Charity Ball at the Riverview Ballroom in Hudson, Massachusetts, 38 miles west of Boston. This year’s charity is CaRMaH (Cat Adoption and Rescue of Marlboro and Hudson). I will be leading the ritual together with our hostess, Lady T, and Ron Sinclair-Clee of Avalon Rose Cottage. There will be live entertainment, a costume contest, raffle, readers, and vendors, including me. I’ll be signing books: there will be books for sale, but I’m also happy to sign books you already have. Although comparatively intimate and relaxed, this is not a local event: there are numerous hotels, motels, and B&Bs in the area. For more information about accommodations, please contact Charmed in New England. If you are making a weekend out of it, you could join me at Charmed in New England (Marlboro, MA) for a workshop on the following day, 1 November 2014. (That said, the workshop and the ball are two separate entities; one does not need to attend one to attend the other; you are welcome at either or both) The workshop begins at 3:00 pm, so you have time to sleep and dream after the ball. November 1st is the Feast of All Hallows, also known as All Saints Day. 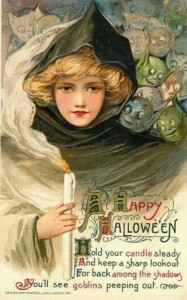 It is also the Eve of All Souls Day or the Day of the Dead. This is a multi-pronged workshop— we will be honoring and discussing the sacred Lords and Ladies of the Dead, but we’ll also be erecting a temporary Day of the Dead altar and decorating sugar skulls. I’ll be signing books at Charmed, too. Books will be available for sale, but you can also bring previously purchased books for signing. Baron Samedi & Maman Brigitte by Raven Morgaine of Familiar Spirits, Rhode Island. days of November. It is thus the opportune time for contacting and honoring beloved souls who have passed into the next existence. 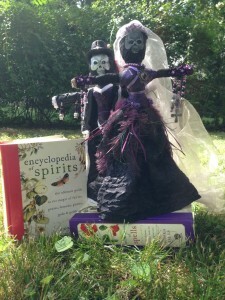 The Feast of All Souls or the Day of the Dead is celebrated on November 1 and 2— and sometimes longer— by many cultures and in many places, but most famously in Mexico and Haiti. 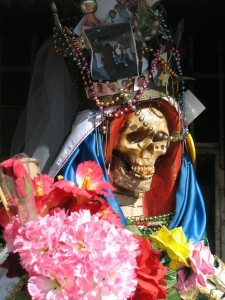 Mexico’s unique Day of the Dead festivities evolved from the ancient Aztec Festival of the Dead, presided over by Mictlancihuatl, the Lady of Death. Some believe that Mictlancihuatl has evolved, too, and that Santissima Muerte (“Most Holy Death”— saint, goddess, and angel of death) is a modern manifestation of this ancient goddess. During this workshop, we will discuss all these sacred beings, Day of the Dead traditions, and ways to honor your departed ancestors and loved ones. Sugar skulls— molded, decorated candy skulls—are among the most emblematic Mexican Day of the Dead traditions. Following our discussion, class participants will have the opportunity to decorate their own individual sugar skull. Sugar skulls, as well as decorating supplies, will be on-hand at Charmed, but feel free to bring your own embellishments, too, if you like. ** As part of the class, we will set up a temporary altar dedicated to the Beloved Dead. Please feel free to bring photographs, images, or other objects associated with your loved ones on the Other Side: these could be biological, spiritual, or magical ancestors or someone else that you would like to honor. The altar will be disassembled following the workshops and all objects returned to their owners. • Please contact Charmed in New England for information and reservations. The class is restricted to twenty people and it is filling up.